Mr. Charlie #84 says that if Jeffrey Brown worked in movies, he would currently have a first look deal with Fox Searchlight or Focus Feature. Certainly IFC would have already approached him, not to mention having a screenplay already optioned. Just how many actresses hoping to take the indie route to Oscar gold would be looking Jeffrey’s way? If Jeffrey Brown worked in music, he might have already received a Grammy nod in the alternative performance category. He’d certainly be the darling of college, alt-rock, and modern radio. Already having mentions in Rolling Stone, Spin, and Entertainment Weekly, he might even get a mention in Vibe or The Source. He would have already performed on more than one late night talk show. Just how many Time Magazine music short lists is he on? If Jeffrey Brown wrote novels, short stories, fiction, etc., he would have been on “Ellen” or “The View,” already, or they would discover him soon… very soon. Appearances on The New York Times bestseller lists, an Amazon.com notice, essays and critiques of his work in the book review sections and supplements of major newspapers would be definite possibilities. But Jeffrey Brown works in comics, and so his bittersweet autobiographical and quasi-autobio tales of romance and girl woes have indie buzz, which in the Direct Market amounts to the kind of temporary notice we might give a fart. 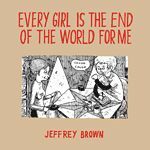 The occasion of the release of EVERY GIRL IS THE END OF WORLD FOR ME (Top Shelf Productions; $8; ISBN: 1891830775) is another chance to discover Brown’s work. The 5¼ x7½, 104-page paperback book is an epilogue to Brown’s “Girlfriend Trilogy” (Clumsy, Unlikely, AEIOU). Every Girl details the day-to-day events of Brown’s three-week (December 26, 2003 – January 15, 2004) run-in or dating marathon with five girls, and that includes a reconnection with an ex and a crush that ultimately goes sour. Every Girl’s two dominant themes are that friends come and go in life and that the end is never really the end. Brown goes about this in an organic way, not forcing the storytelling. Early on, the book comes across as rather dull, but once the reader catches on to the rhythm, it is then that he notices the interpersonal dynamics. People become connecting. Each needs something from the other. Their motivations are not at all the same, even if in some ways they are similar. Bonds form, even bonds that may fracture and ultimately come apart. But once some intimacy, some deeper union that rarely forms from a chance, brief, or temporary encounter happens, the soil is plowed and a seed is planted. There is no end between two people who have invested in a link of some degree of intimacy with each other. Even if they part for ages, when they reunite, they will find something of the link remains. Every Girl is the End of the World for Me is not a light confection, taking a pedestrian look at the politics and trials of the dating game and “relationships;” you can get that from TV. With feigned simplicity, Brown gives a view of the symbiosis of friendship – links, bonds, and chains that don’t completely fall away. http://www.negromancer.com - ease on down there!